Description: Clip art photograph of some kids at some kind of military weapons show or recruiting session. 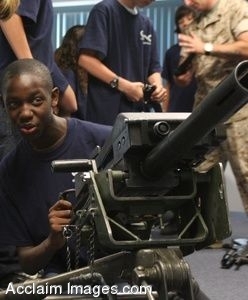 The boy shown in the front of the picture is hands on a machine gun, while a soldier shows a hand gun to another boy in the background. Clipart photograph by Department of Defense Public Domain.